And you thought you were cool because you lined up at midnight and bought a PS4 with your own money. Tyler Esposito, meanwhile, gets to say that he got a SNES on August 23, 1991. 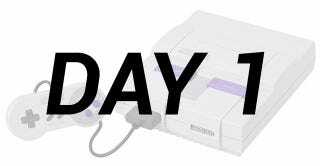 The day the console was first released in the United States, when it retailed for $199. Well, he gets to say it, then relive it endlessly and brag about it to the world, because his Dad was smart enough to film the whole thing (and more!). The induction ceremony begins around 1:45 below.